She is going to do wants she wants. 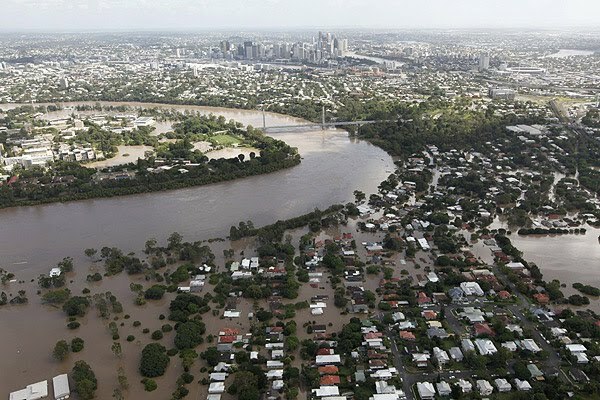 To those who have contacted me about the Australian floods I am a couple of States away from where the worst of the flooding is (there is now flooding in five of our six States). BUT, I have been feeling awful that I left my parents high and dry and moved them to the sunny State of Queensland a few weeks ago to enjoy the hot weather and fabulous water views that they have wanted to experience for a long time. And, as it has played out, the weather and the water views have exceeded everyone's expectations or indeed imaginations. My father Des thanked me for my relocation efforts but wondered if perhaps I had gone a little overboard in helping them realise their wish. You see it has rained hard every day since they got there and now they are experiencing massive floods - the worst the State has ever seen. As Des said, he was actually hoping to look out his window and admire the extensive water views not actually be forced to float out his window into gushing torrents of muddy water. It's a good job they have a sense of humour. I realise that such luck has not been the case for many thousands of people who have lost a great deal. Some have lost their lives, others everything but the clothes they had on when they hurriedly left their homes and many people are still missing. It is surreal. I posted pictures only a few months ago of this beautiful State when I went on my road trip. As with every disaster, the stories of horror, heroism and amazing personal fortitude abound. The unlimited care and compassion that people have shared during this disaster has been inspirational and makes me very proud to be an Aussie. The human spirit is powerful when put to the test. So if any Australian readers want to volunteer to clean up cities or donate to help those in need please go here. Any US readers, particularly those who have seen any flood coverage on your TV networks, please take a look at Oprah's shows next week (from Tuesday 18) to see some of the best Australia has to offer - as opposed to only the sodden mess being beamed around the world at the moment. I will leave you with a picture of Melbourne taken a couple of days ago, showing the kind of water views that we (thankfully) normally only get to see here in Oz. The weather I think is experiencing the La Nina or whatever effect because the season is kinda a little out of sync. We are having a lot of rain too lately. Glad to know your family is together and safe. It's been quite a while since I've been here, but I've been thinking of you and all the other wonderful Australian bloggers I've met over the years. My heart and thoughts are with the people of Australia right now. You are right to point out that the good qualities of kindness and help for your fellow man come out in times of trouble. All the best you, your family and country. Good to know you and your family are okay Lilly. We really never know what's in store for us. Hope things improve soon. I've been thinking about you too, Lilly. I'm glad you're doing OK, but oh my! Your poor parents! We've been hearing quite a bit about your awful flooding on the news. I am so sorry. There seems to be a ton of precipitation everywhere. All the tourists are suffering here in Hawaii because of the heavy downpours. It kept me awake last night wondering when we'd lose power because of the lightning storm and torrents of rain. There was flooding in the lower areas, but nothing to compare with what's happening in your neck of the world. Take care! There is really something going on given all the strange weather patterns all over the world. My prayers are with everyone affected by the flooding and hope they pull through quickly and things can get back to normal for everyone. Glad Des is ok - good job he likes the water is all I can say given he is seeing enough of it these days. We want his first hand account as it is about time he guest posted again. Yes, I have seen the news! Personal experience it's rough dealing with this and the loss of so many! Prayers to all. And we have snow on the ground in 49 of our 50 states. Wow sounds like strange things are happening everywhere. Global weirding indeed!! Gee, where have I been all these days, weeks, months? I haven't watched TV for so long and don't subscribe to the paper, I've been so out of touch with the world, it seems like. It's only now that I've read about your terrible flooding and feel awful that it's only now that I came to say hello. Glad to know that you and your family are okay and still have your good sense of humour well intact. I'll be writing you through email soon.